St. Jacobs/Waterloo, ON, October 3, 2017 – Moxa is adding a new 7-inch fanless industrial panel computer, the MPC-2070 Series, to its rugged panel-computer family. These panel computers are designed for outdoor HMI applications such as solar inverter monitoring, drill control, and wellhead/pipeline monitoring. It can also be deployed on marine decks and in hazardous factory environments where dust explosions are a major concern. The MPC-2070 panel computers feature an energy-efficient Intel® Atom™ E3826 1.46 GHz processor with an average power consumption of 10 W. Packed in a rugged, fanless enclosure, it can withstand temperatures from -40 to 70°C, and its unique fast boot-up feature enables the MPC-2070 to be ready for use in less than 3 minutes, even in extremely cold environments all the way down to -40°C. 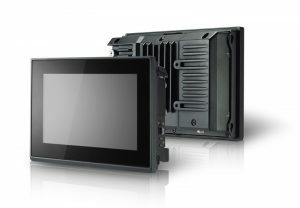 The MPC-2070 Series also features a sunlight-readable 1000-nit display with a glove-friendly multi-touch screen, providing an excellent user experience for outdoor HMI applications. This series is also designed to meet the standards of Class 1 Division 2, ATEX Zone 2, and IECEx Zone 2 certifications*. Communication interfaces on the MPC-2070 panel computers include two Gigabit Ethernet LAN ports, two USB ports, two RS-232/422/485 serial ports, four digital inputs, and four digital outputs. To meet the high demands of Industrial IoT applications, the MPC-2070 panel computers are Microsoft Azure Certified for IoT, which means that they are pre-tested and verified to work with Microsoft Azure IoT services. Windows 10 IoT models are also available by request.